About 1,200 people were killed by police officers in the U.S. in the 12 months that ended in May, according to a federal report released Thursday. 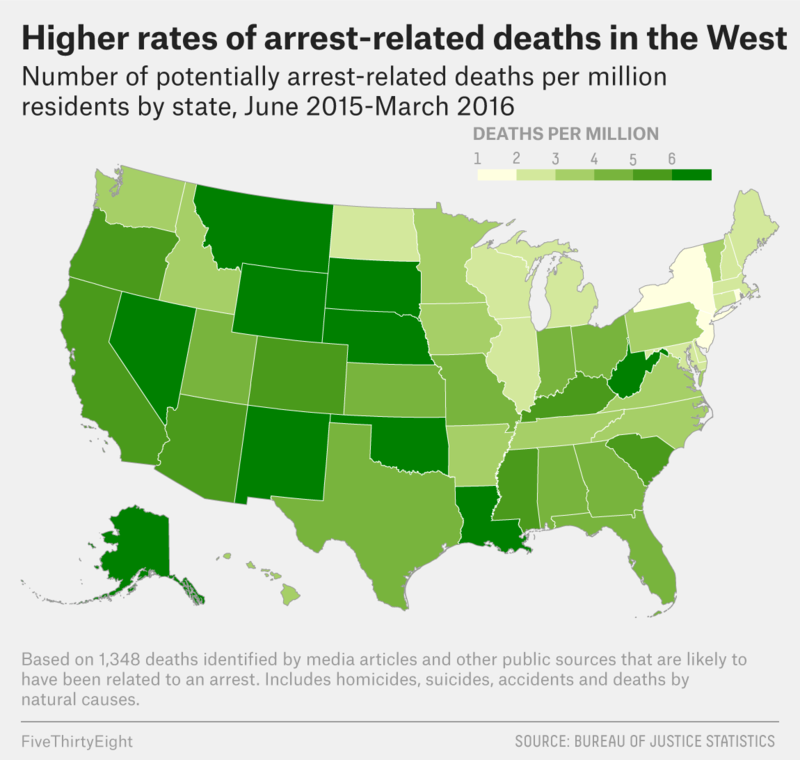 That number is much larger than government counts of police killings for earlier years — and is much more in line with private estimates. Criminal justice researchers have long argued that official counts of police killings, which rely on voluntary reports from local police departments, are woefully incomplete. Over the past decade, about half a dozen efforts by activists, volunteers and media organizations have sprung up in response to widespread outrage about high-profile killings by police officers to try to fill the breach using information from media reports and other sources. Their annual death toll estimates since 2013 have generally ranged from 1,100 to 1,400, more than twice as high as the counts from official government sources. The corroboration by BJS of other outfits’ numbers “speaks to the power of some of what we’ve been collecting and what so many others have been collecting — that it’s really been able to approximate those numbers,” said Samuel Sinyangwe, who leads one of the volunteer efforts, Mapping Police Violence, and co-founded Campaign Zero, a group that promotes policy ideas that it says can reduce the number of people killed by police officers. Sinyangwe said the new estimate from BJS “sounds correct.” Mapping Police Violence lists 1,198 people killed by police during the period covered by the BJS report; the Guardian, which has been counting police killings since last year, lists 1,127. Sinyangwe and other activists worry, however, that the government’s new efforts to collect better data on police killings won’t continue under Donald Trump and his nominee for attorney general, Jeff Sessions. If the Senate confirms Sessions, “I am skeptical about whether they will move forward with this,” Sinyangwe said. Spokespeople for Trump and Sessions didn’t return emails seeking comment. Now the government is trying to improve its data. Last year, BJS researchers found that the agency’s existing methods of counting arrest-related deaths — basically, asking police departments to report totals — were probably missing about half of all cases. (Some researchers think even more were being missed.) Thursday’s report builds on that research by trying to find the deaths that were missing from official counts, using several methods. The researchers also asked local agencies whether there had been any deaths that weren’t reflected in media accounts. That allowed them to estimate how many deaths their media-based counts were missing — information that BJS then applied to a full year of data to arrive at its annual death-toll estimate of 1,900, including 1,200 homicides. Deaths by suicide, accident and natural causes were more likely than homicides to get no media coverage. Using media accounts to supplement official reports has become a common research tactic in the grim accounting of terrorism, school shootings and police misconduct. Since 2009, the BJS has used what Planty called an “ad hoc” process of analyzing media accounts to improve its collection of police killings by identifying cases that agencies weren’t proactively reporting. It also isn’t cheap. Even after researchers found ways to dramatically reduce the number of media articles that their algorithm flags, the work costs $40,000 a month, Planty said. It’s not clear how the Justice Department will collect police-killings data in the future. The department hasn’t committed to adopting the methods described in the new report for its official statistics. (On Thursday afternoon, the department said it would release more information about its data-collection plans on Friday morning.) BJS has more work ahead of it, including reports planned for next year delving into the characteristics of people killed by police — other efforts have found that black Americans are killed at a rate much higher than their share of the population — and comparisons of its data with nongovernmental counts. The FBI is also mounting a parallel effort to get better data. Even if BJS does proceed with more complete data collection, it won’t necessarily replace private estimates. Sinyangwe said he plans to continue his work regardless, because unlike BJS, which only aggregates deaths for statistical purposes, he and other independent counters provide details on individual deaths, allowing for more granular analysis. D. Brian Burghart, who founded and runs another police killings database, Fatal Encounters, said the BJS effort was long overdue. He said he started his site because he “realized that the internet meant this information could no longer be hidden.” If the government improves the way it collects data, Burghart said, he would be happy to step aside after nearly five years. For the report, researchers identified about 1,700 deaths that likely were the result of an encounter with a police officer or occurred during an arrest for the 12 months that ended in May. For the first three months of the period — June through August 2015 — they investigated the number of deaths more extensively and found that the true count was about 12 percent higher than the initial estimate. Applying that same 12 percent adjustment to the entire period yields the estimate of 1,900 deaths. The report does not give an estimate of how many of those 1,900 deaths were cases in which people were intentionally killed by police officers, which the BJS classifies as homicides. However, report co-author Michael Planty of the BJS said that by assuming that the proportion of deaths that were homicides was the same for the whole 12-month period as for the first three months — 64 percent — you can conclude that approximately 1,200 were homicides and the other 700 were mostly suicides, accidents and deaths by natural cause (the cause of death was unknown for about 75 people).